For anyone who has not read the Post regularly over the past couple of decades, Mathews is well-known around here for writing full-throated, uncritical columns championing the AP program. Last month alone, three of his five columns centered on that topic. The fall Education Edition of the Post Sunday Magazine published in October also featured an eight-page spread by Mathews that was ostensibly a profile of the director of the AP program. It was a sloppy wet kiss that a casual reader might have mistaken as nothing more than an “advertorial” paid for by the College Board, mixed in with the other ads for private schools, tutoring services, and military boarding academies. In all of this promotional work (including at least three related books), Mathews rarely does much to address critics of the AP program. Mostly it consists of setting up very flimsy straw men and quickly knocking them down with a very dismissive attitude. Anyone who doesn’t agree that AP should be the foundation of a high school academic program is misguided at best. Toward the end of the Sunday Magazine article, he mentions in one paragraph two rather prominent critics of the AP program, and then allows the subject of his piece to dismiss them with a couple of quotes containing no real rebuttal. One of those critics is the 2009 documentary “Race to Nowhere”. In the film, produces look at how students are under increasing pressure to “succeed” in school, including by being pushed into taking more AP classes. The other is a 2012 article from The Atlantic with the provocative title “AP Classes Are a Scam”. Although I wouldn’t go so far to call the program a scam, the author, a former government professor at Boston College, makes some excellent points that deserve to be part of the debate. His last bullet point is one of my favorites. To me, the most serious count against Advanced Placement courses is that the AP curriculum leads to rigid stultification — a kind of mindless genuflection to a prescribed plan of study that squelches creativity and free inquiry. The courses cover too much material and do so too quickly and superficially. In short, AP courses are a forced march through a preordained subject, leaving no time for a high-school teacher to take her or his students down some path of mutual interest. The AP classroom is where intellectual curiosity goes to die. Which relates directly to some of my primary criticisms of the AP program, and especially the huge emphasis the classes receive in most high schools in this area. For one, the whole AP program drives an assumption that the goal of every student should be attending a four-year college. Indeed, the entire curriculum is dictated by university officials who benefit from the stream of new customers. Too often, kids are given the impression that anything other than a brand name college represents failure. Looking at the bigger picture, the AP structure reinforces the idea that a pure academic approach is the only way to understand any subject. That subjects can only be studied within their silo, a segmented approach to learning that was already an entrenched attitude in most of the high schools I’ve worked with over the years and now extending down into the lower grades. That intellectual curiosity the professor spoke of is difficult, if not impossible, in a rigidly designed curriculum that leaves little room for exploration outside of the silo. Anyway, after all that ranting, I wouldn’t advocate for high schools to drop AP classes entirely (as some schools are doing). I’ve both taken and taught AP courses, as well as spending a few summers scoring them and there is some value in the concept (if not the current execution). Schools should be providing students with the option to participate. With the emphasis on option. We need to help students understand and explore ALL their options during their time in K12 classrooms. Structuring high school entirely around a college-level program, which Jay Mathews appears to be pushing with his AP love affair, slams the door shut to those choices. Image: Exam by Alberto G. Posted to Flickr and used under a Creative Commons license. 1. They also own the equally profitable, and questionable, SAT and other related testing programs. You can find more data on the finances of the College Board and other “non-profit” testing groups at Americans for Educational Testing Reform. 2. If you want to torture yourself with it, I’ve written far too much about that crap in this space. After reading his weekly column1 in the Monday Washington Post, I wonder whether Jay Mathews is confused. Or recanting everything he’s written for the past two decades or so. To help each child achieve his or her full potential, we need an education that starts from the child’s passions and strengths, instead of prescribed skills and content. The education system rarely cares about the children’s individual passions or talents. The only passion it cares about is the passion to become a good student. .?.?. Worse, the current education system actively suppresses individual talents and passions by defining what educational success means and convincing students, parents and the public to accept the definition. I saw why so many critics of the American system have wrongly trashed the true sources of our nation’s power to fuel individual passions. They are high school activities: band, football, field hockey, robotics club, hip-hop club, drama, choir. The list is endless. I have yet to find an American high school that successfully suppressed individual talents or convinced students and parents to sacrifice all for study. He uses as “evidence” the lack of homework done by high school students and the popularity of extracurricular activities to declare that Zhao is wrong. That the American education system is already allowing kids the kind of choice to follow their passions and talents. Although I’m not sure high school band and football would be especially good examples for that “choice”. As for not being able to find American schools that suppress individual talents or convince students to sacrifice all for academic work, Mathews only needs to read some of his own writing. This is coming from the man who created a ranking of high school quality based primarily on the number of Advance Placement tests taken by students. A scale, coming this spring to a district press release near you, that pressures schools to increase the numbers of those tests taken. For that matter, Mathews is totally in love with the whole AP program, one of the most standardized curriculums ever created. A collection of syllabi largely dictated by colleges, and which offers students no choice in what they study. He also regularly writes about heaps praise on the KIPP chain of charter schools, whose regimented and highly structured educational program offers students few options to follow their passions. Ok, so maybe Mathews isn’t confused or having a change of heart. It’s possible he’s just punking those of us who have been reading his dreck for these many years. Either way, it’s time for Jeff Bezos and the Post to find a better, more relevant education writer to fill that scarce resource quarter-page of newsprint every week in the Metro section. 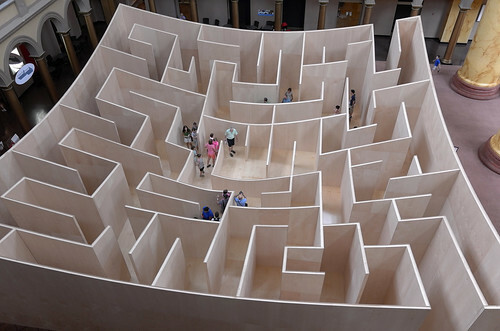 This picture is of a maze installation at the National Building Museum from about four years ago and just seemed appropriate for the twists and turns in Mathews’ logic. Image by Brett Davis, posted to Flickr and used under a Creative Commons license. 1. I’m not sure why the online title for this piece is completely different from the headline in the printed version: “Want kids to really achieve? Focus on nerdy clubs, team sports instead of tests.” Starting with the term “nerdy”, there is just so much wrong with that, although both headers could have been written by an editor instead of Mathews. There are many things I don’t understand about the writing of Jay Mathews, former chief education writer for the Washington Post and current weekly columnist. Mostly why the paper continues to waste valuable newsprint on his work. His column from last Monday is a good example. Mathews begins by condemning the decline in the number of states that require students to pass one or more standardized tests in order to graduate. He says this a “national movement led by educators, parents and legislators”, calling it a “breathtaking turnabout, but without much celebrating”. Because polls related to public perception of school quality have not changed in five years? He continues by complaining about “creative programs to boost achievement” being used by some states. Mathews says, those efforts are “failing miserably”, according to a report by “45 experts (including many teachers) who peered deeply into the state plans required by the new law”. After spending the first half of the piece trying to make the case that the lack of standardized testing is hurting schools and students (with his usual lack of evidence), Mathews actually writes a statement that makes sense. The rash of standardized testing after the No Child Left Behind Act became law in the early 2000s did not raise achievement averages very much, but the Collaborative for Student Success study indicates that reducing exit tests is not likely to bring much improvement, either. So, maybe the focus of Mathews column should have been on alternatives to standardized testing, which he admits don’t seem to make any difference. Anyway, this mess ends with some additional odd and unsupported statements, including his usual plug for the Advance Placement program. Which, of course, is another standardized testing program, one run by colleges rather than states. We love making schools more accountable. Then, we hate the idea. This new decline of exit tests will almost certainly be followed by another burst of outrage and a renewed campaign to raise achievement. Fortunately, our schools are still attracting many energetic and creative teachers who want to make a difference. As always, that will be what saves us. Does he understand that the excess of standardized testing has been driving “energetic and creative teachers” out of the classroom for a decade or more? And why is this crap allowed to appear in a major national newspaper? Image: Exam by Alberto G. on Flickr, used under a Creative Commons license. As promised, Jay Mathews is back with a followup to his promotion for a new anti-edtech book, written by two high school social studies teachers here in Fairfax County. If possible, his installment this week features even more cliches and overly broad generalizations. Mathews begins by citing the long discredited myth of the “digital native”, and follows that by completely misrepresenting (and likely misunderstanding) the work of danah boyd. All in one paragraph. The rest of the column is a messy collection of anecdotes and unsupported claims from the book. I would love to see the academic studies they found using phrases like “toxic environment” and “superlearners”. But what about the broad range of research that arrives at very different conclusions? While the negative side too often gets the headlines, studies of how technology impacts learning is hardly conclusive. And this blanket statement alone makes me think the authors are not going for any kind of balance in this book. Social studies teachers, they reported, are being encouraged to move “to DBQs, or document-based questions, which are simply research papers where the teacher has done all the research for the students.” Clement and Miles stick with real research papers, after students learn about different types of evidence and plan investigative strategies. Yet their students often become frustrated when devices don’t lead them to a useful source right away. Completely ignore the issue of whether writing “real” research papers is even a valid assignment anymore. Back before the evil internet, very few teachers just dumped their kids in the library and ignored their frustration with finding appropriate material. The process of searching for, validating, and using evidence was a key part of the learning. It still is. If anything, these skills are even more important for students now. And banning the use of “screens” for research borders on educational malpractice. The only idea by Mathews and the authors in this mess that makes any sense is that parents (and students and teachers) should ask questions about the use of technology in schools. But “May I opt my child out of screen-based instructional activities?” is not one of them. Instead, go deeper and challenge educators to respond to queries like “How can the use of technology change and improve the learning experience for my child?” or “How will your instructional practice change to help my child make best use of the technology available?”. Bottom line, I certainly support questioning the use of “screens” in the classroom. However, recommending, as the authors (and probably Mathews) do, that “teachers reject most of ed-tech” is completely unrealistic and extremely short-sighted. It’s a matter of how, not whether. In his regular weekly column for the Washington Post1, Jay Mathews wants us to know about two local teachers who have written a book containing “discoveries that threaten the foundations of the high-tech classroom”. I haven’t read more than the excerpts provided by Mathews and the Amazon sampler for the book, but I have a few observations anyway. (1) deliver instruction in the simplest possible manner; (2) focus instruction on what students are able to do; and (3) foster face-to-face human interaction and opportunities for community building. That opening phrase “deliver instruction” is certainly at the core of the common view of classroom pedagogy. Someone designated as “teacher” delivers a package of carefully curated information to a group known as “students”. Unstated but assumed, of course, is that students will display the amount of information they have retained at some point. In the third principle, the idea of “community building” is wonderful. That should be one of the primary goals of classrooms and schools. However, real communities are built by the members, not framed by someone else. Leaders come from within the community, not assigned to that role. Then there are the opening lines to the first chapter of the book itself. Something is not right with today’s kids. You know it, and I know it. That is followed with the far too common indictment of “screen time” and the “misuse” of social media and technology in general, complete with the fictitious example of “typical” teenager Brett as he gets up and goes to school. Just that part of the book includes an incredible number of cliches disparaging both students and their teachers. I’m completely torn as to whether I want to read more. However, in the course of the article, the authors’ and Mathews do land on a few truths. Students need no help from schools developing their tablet, smartphone, or Twitter skills. They are doing this on their own. But not the conclusion that follows. What they need help with is critical thinking, problem solving, and community building. Most kids do very well with developing those skills. Just not for the material you are trying to get them to understand. So, did you consider that maybe the problem isn’t with your students and their use of technology but instead with this structure we’ve designed for them call “school”? Is it possible the curriculum we expect them to learn is a major part of the problem? Large parts of that material is irrelevant and does little to foster those problem solving and community building skills mentioned several times. Not to mention they way it is “delivered”. Plus the kids are very well aware of why the teachers want them to absorb the information in the first place: it’s on the SOLs (Virginia’s standards of learning), it will probably show up on a test sometime in the future, and they must pass the test to “succeed” (and keep the schools/district numbers high). In the end, I do not disagree with these teacher that there is something wrong with how we use technology in school. The problem, however, is that, for the most part, we are trying to replicate the standard school experience through screens. We want to maintain the same curriculum, pedagogy, and academic framework with some computing devices slapped on the side. Instead of taking full advantage of the available power from devices and networks to reimagine the entire learning experience. Next week, I will get into what they say can be done to turn back the acidic distractions of the tech revolution in our schools, and save just the stuff that works. 1. The title in the paper, “Teachers demonstrate the power of fewer screens and more human interaction” is completely wrong; the online title “Hitting the return key on education” makes no sense.